bebop spoken here: And the MD Danced ! The Customs House Big Band with Paul Edis and Emily McDermott @ St. Cuthberts Parish Centre, Crook - June 8. And the MD Danced ! 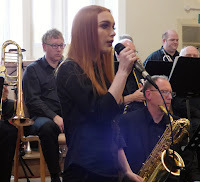 The Customs House Big Band with Paul Edis and Emily McDermott @ St. Cuthberts Parish Centre, Crook - June 8. 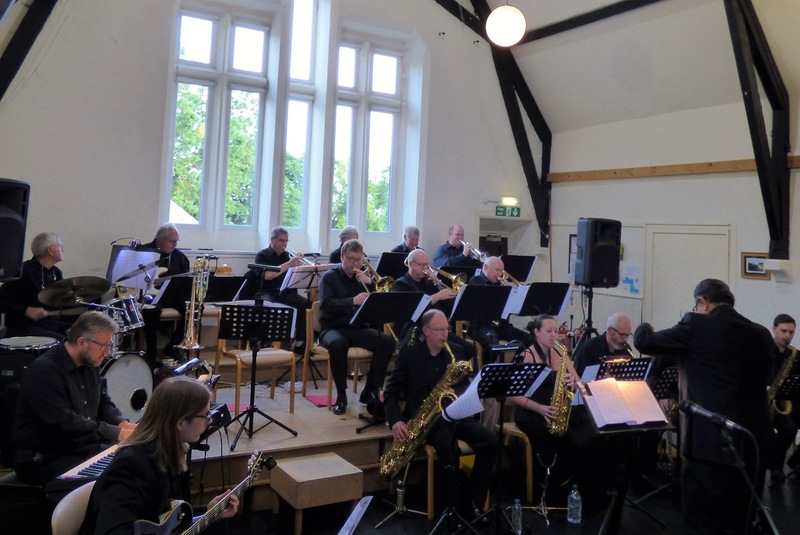 A beautiful evening saw the welcome return of the Customs House Big Band to Crook for some great pizza, even better music and still no raffle prize for yours truly! I’ll keep trying! Ruth Lambert could not be there – best wishes from all us fans, Ruth – but Paul Edis and Emily McDermott were, to provide some vocals and some variety. Bang on time (I love that!) the band launched us into a tune with a nice, clean finish (I love that, too) which I thought Peter Morgan announced as Recorda Me, but which I couldn’t find on Google when trying to check. I found the mic. a problem all night and missed many of the intros, which was irritating, and struggled to hear Emily McDermott’s vocals, which was criminal! Anyway, Paul Edis then took centre stage to conduct while the band played some of his own arrangements and compositions. First up was Bright Mississippi, a Thelonius Monk contrafact (yes, I’ve been Googling again!) based on Sweet Georgia Brown, some bits of which I was still able to recognise. Loved it, as I do the original. Among other solos here we had the first of many from another Jambone graduate, Bradley Johnston. Great stuff! Another clean-picked solo followed on The Coast, a Jobim influenced Edis original where flute and piano (sorry, can’t name the soloists) were also prominent. Two vocals from Emily followed – My Funny Valentine (arr. Edis) and Rome Wasn’t Built in a Day (Edis original). The aforementioned problems with the mic seemed to unsettle this promising young singer on the former and, although she was more confident on the latter, receiving “whoops” of approval, the volume still wasn’t balanced so we didn’t hear that clear, powerful voice at its best. I look forward to the next time. Last of the Edis contributions was The Narrow Escape, a “sort of cartoon theme” up-tempo number, and then Peter Morgan returned to lead the band in Halleluiah, I Just Love Her So, the closing number for the first set. This featured some nice muted trumpet, a tenor sax solo and some audience participation – clapping in time to the music at the MD’s invitation. He had less success in the second half, trying to incite dancing, though his own nimble movements from conducting out front, up the steps to bass-tromboning with the band, set a fine example on Flight of Fancy (where trombones were to the fore but the drummer seemed to stitch it all together) and Stolen Moments. He observed that he could see people “twitching” to dance (there were feet tapping and shoulders swaying all evening, to be fair) but no-one took to the floor. As if despairing of the Crook crowd he began waltzing an imagined partner towards the door, but came back to conduct The Way You Look Tonight, which seemed to start and end with a fanfare and swung outstandingly in between. Another missed title (a Buddy Rich number?) kept the feet tapping then a rousing drum intro launched us into A Few Good Men. Next, Why Musicians Can’t Dance (or even shuffle?) was flagged up by the MD as “our excuse” – the implied question, presumably, being “what’s yours?” Impervious to subtlety we maintained our Britishness and kept to our seats through the last number, Stomping at the Savoy (which made us twitch a lot) and the one after the last number, Stepping Out (which made us twitch even more but which had the MD in full Michael Jackson mode by the end!). Cue lots of applause then we stepped out from the wall of sound (Phil Spector is credited with inventing that but big bands got there years before him!) into a perfect sunset. It was that sort of evening!